Our affordable custom products feature 3M inks and films. 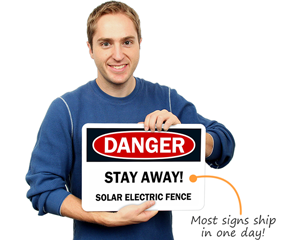 The overlaminate protects signs for over 10 years. When do you need to use danger, warning, caution, or notice designs? Learn more about the important standards and definitions for each. 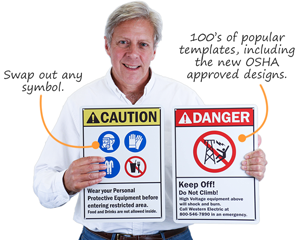 Learn how to design effective, OSHA-compliant warnings. Compare OSHA and ANSI standards that might impact your business. Take a quick, free quiz to test how much you know about everything from back safety to hazardous materials. In a hurry? Download a free, official design or create your own. 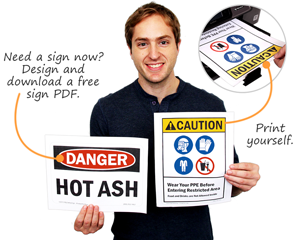 Print your sign while you order a sturdier one for your workplace. Stock products ship in 1 day. All orders over $9.95 ship for free! You can’t beat our standards. 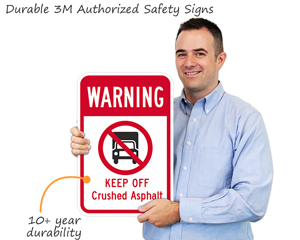 3M warranty.